Everyone knows the name Rachael Ray; she’s fun, sassy and creative in the kitchen. 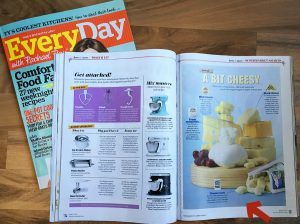 Well, turns out she also knows her cheese, and in the March 2015 issue of Every Day with Rachael Ray magazine, under her Faves & Saves section, you’ll see her Supermarket Smarts got a bit cheesy. Right on trend, the magazine featured single-serving cheese options catching everyone’s attention in supermarkets across America. Mini-wedges, mini-wheels and bite-size cheese balls made the feature. But our eye was drawn to the pretty white and blue bag with the Ellsworth Cooperative Creamery logo. The one from the Cheese Curd Capital of Wisconsin. Yes, we could hardly believe our eyes! We weren’t expecting the mention, and received word about the feature from a couple of loyal Facebook fans (Thanks, Nancy and Dan!). While here in Wisconsin we can’t imagine anyone growing up without cheese curds, there’s many around the country that have no idea what a cheese curd is. Those times, they are a changin’! People everywhere are discovering all there is to love about cheese curds. They make the best snacks, they taste great, and they’re fun to use in your favorite recipes… and we’re hoping that next Rachael will give them a try in her kitchen!